I am a neuroscientist funded by the NIH BRAIN Initiative currently working at Stanford University as a post-doc in Luis de Lecea’s Lab. I was born in Washington, D.C. and grew up in the district until I went off to college where I majored in biological anthropology, at Indiana University - Bloomington. Following graduation, I worked as the assistant project director at the Semliki Chimpanzee Project in Western Uganda, where I worked to combat poaching in the region, habituate the chimpanzees, and collect ecological data. Fascinated by animal behavior, I decided to switch to neuroscience for my graduate education. This allowed me to causally test my hypotheses via direct manipulation of the brain. I wrote a short piece in Science detailing my struggles with switching fields. In graduate school (Randy Nelson's lab at The Ohio State University), I became interested in one of the most important behaviors for all animals on the planet: sleep. The ultimate purpose of sleep is an evolutionary mystery, as we can’t do many important things while we are asleep, including mating, eating, avoiding predators and competitors, and foraging for resources. For sleep to evolve with these caveats, it must serve an essential purpose that does not lend itself to compromise. While I was thinking about the underlying mechanisms of sleep and wakefulness, I attended a talk by a graduate student in another department, on clinical complaints of patients with breast cancer. During the talk, the speaker highlighted that sleep disruption and fatigue are among the most common complaints of these patients, and the mechanisms that cause these problems are unknown. I soon realized that mechanistic studies on this topic are scarce. A ‘chicken-or-the-egg’ phenomenon exists: poor sleep associates with elevated cancer incidence and progression, and cancer and/or cancer treatments further promote sleep disturbance. Due to heterogeneity among cancer types, patient populations, treatment regimens, and lifestyle factors, it has been challenging to pin down cause and effect (see the Figure below). This lack of knowledge prevents targeted therapies from being developed and impairs quality of life and lifespan in cancer survivors. In my work, I investigate how the brain interacts with cancer and cancer treatments, using techniques from neuroscience, immunology, cancer biology, and endocrinology. Using these approaches, I demonstrated that cytotoxic chemotherapy drastically alters sleep/wake states (independent of cancer). I built on these findings and found that the circadian clock dictates the inflammatory response to cytotoxic chemotherapy, suggesting that timing of drug administration is extremely important to attenuate side effects. 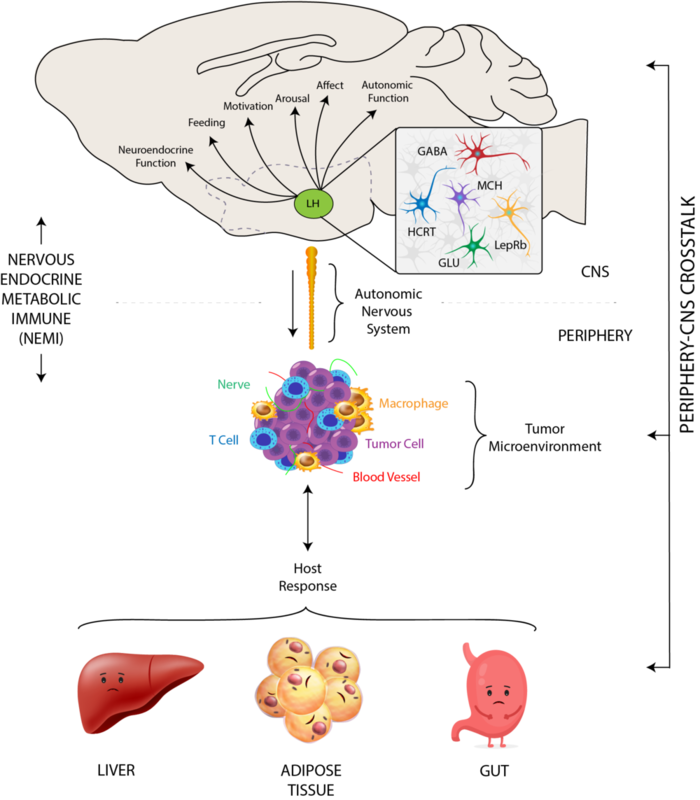 Further, I was first to conduct mechanistic studies of cancer-associated sleep disruption, uncovering how tumors deregulate endocrine signals to alter the activity of hypocretin/orexin neurons in the lateral hypothalamus. I am currently continuing this line of work, using systems neuroscience approaches to understand how signals deregulated by cancer alter the activity of discrete neural populations. Please visit the Research section to see all my active projects. IMPORTANT: Visitors are welcome to use any media on this site, as long as the author (Jeremy C Borniger, PhD), is credited. Please send an email (jcbornig@stanford.edu) for express consent. Learn about my ongoing research projects. See recent news updates about my research.